April 24, 2017: The Haisla Nation Trapper’s Cabin at the entrance to Brim River has been removed and will not be replaced. Brim River Hot Springs Protected Area and the adjoining Owyacumish River Park epitomize the rugged terrain and spectacular scenery of the BC north coast. 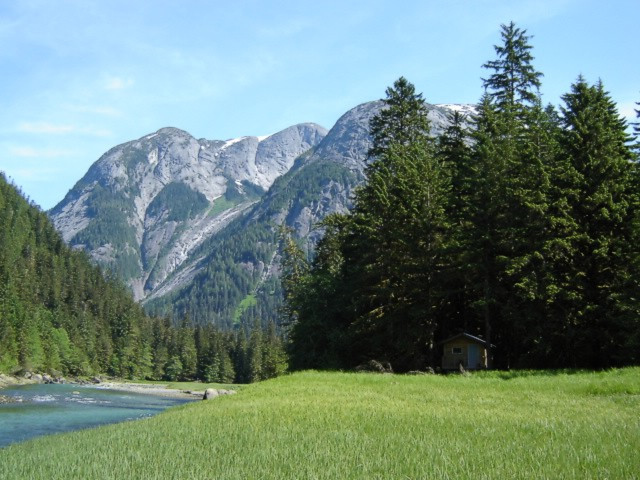 The rivers flow through narrow valleys with steep, bare rock walls interspersed with numerous waterfalls; all of which are surrounded by the snow-capped peaks of the Kitimat Coastal mountain range. Special Features: The area contains an undeveloped hot spring and their unique plant associations, old-growth forests, and an exceptional range of undisturbed natural plant communities. The remoteness and pristine condition of the area, in combination with the marine – freshwater interface, ensures high value habitat that is suitable for a wide range of wildlife species, from shorebirds to grizzly bears. Be bear aware while on shore in this protected area. Brim River Hot Springs Protected Area is located on the north side of Gardner Canal, approximately 15 km west of Kemano Bay and about 70 km southeast of Kitamaat Village. Kitamaat Village and the city of Kitimat are the nearest communities to this protected area. Access is by boat only and Brim River is not suitable for jet boat travel. Use Marine Chart #3745 (Gardner Canal) and NTS Map Sheet #103 H/9 (Brim River). History: Brim River was designated as a Protected Area on March 22, 2005 following recommendations from the Kalum Land and Resource Management Plan. There are opportunities for fishing in Brim River. Anyone fishing or angling in British Columbia must have an appropriate licence. Swimming is possible in the ocean, but the water is cold all season long. The protected area has a natural and undeveloped hot springs with no facilities. The water temperature at the hot springs source is about 56 degrees Celsius. There are other hot springs in the area at Shearwater Hot Springs Conservancy, Bishop Bay-Monkey Beach Conservancy and Weewanie Hot Springs Park which have developed facilities for soaking. Please Conserve: Campfires are permitted but firewood is not provided. If you must have a fire, please burn only dead and down wood, and be sure to extinguish the fire fully. Dead wood is an important habitat element for many plants and animals and it adds organic matter to the soil so please use it conservatively, if at all. We encourage visitors to conserve wood and protect the environment by minimizing the use of campfires and using camp stoves instead. Limited burning hours or campfire bans may be implemented. There are winter camping opportunities in this protected area, as it can be accessed all year. Location: Gardner Canal, north end of Owyacumish Bay, east side of Brim River, about 63 km south of Kitimat. Comments: Undeveloped. Hot springs come out of small stream bed gravel about 600 m up the east side of Brim River. Be aware of bears in the area.